The temperature is dropping and the frigid air is making its way through Yismely Acosta’s jeans and sheer top, but this is not enough to convince her to stay indoors. She decides she wants to go to the party at Saint Peter’s, 140 D Block, East Campus. She walks into the party and she feels the rhythm of rap music beat against her chest. The party is at its peak. Not even five minutes later the music is cut off and there’s a knock at the door. Before she knows it there’s an officer asking her for her ID. Two months later, Acosta receives an email from the Dead of Students, Anthony Skevakis, asking her to come to his office. According to the National Institute on Alcohol Abuse and Alcoholism (NIAAA), about 1,825 college students between the ages of 18 and 24 die from alcohol-related unintentional injuries. The administration at Saint Peter’s wants to make sure they do everything they can to assure its students do not become apart of this statistic. Acosta is one of a dozen students here at Saint Peter’s University who are handed a liquor or drug law violation. All violations are recorded and reported in an annual Clery Act. According to the Clery Center for Security on Campus, the Jeanne Clery Act is a consumer protection law passed in 1990. It requires that all colleges and universities who receive federal funding to share information about crime on campus and their efforts to improve campus safety as well as to inform the public of crime in or around campus. This information is made publicly accessible through the university’s annual security report. During an interview, Saint Peter’s University’s Director of Campus Safety, Scott Torre gave insight to the process of filling out the Clery Report. According to Torre, a majority of the alcohol violations are given to the younger undergraduates, because alcohol is forbidden in the freshman and sophomore dorms. The NIAAA reports that the first six weeks of freshman year are a vulnerable for heavy drinking and alcohol related consequences because of student expectations and social pressures at the start of the academic year. During an interview with the Ronald Becker, Saint Peter’s Director of Center for Personal Development, Becker gave information about alcohol and drug abuse as well as the services they provide at the CPD. “Most people don’t understand what portions look like, what consumptions look like, and what the impact of that consumption can translate into,” Becker said. According to recent data from the NIAAA, many college alcohol problems are related to binge drinking. Over the long-term frequent binge drinking can damage the liver and other organs. The NIAAA states that a “standard drink” is one that contains 14 grams of pure alcohol. This particular serving size may not reflect customary serving sizes particularly in the college environment. A large cup of beer, an overfilled glass of wine, or a single mixed drink could contain much more alcohol than a standard drink. The number of liquor law and drug law violations in campus residence facilities based on Clery reports varies widely from university to university. The following college and universities are all located in New Jersey, and are four-year private nonprofit schools. Saint Peter’s University’s 2014 Clery Act reported that 28 drug law and 49 liquor law violations occurred in campus resident housing. Rider University reported seven-drug law and 172 liquor law violations. The College of Saint Elizabeth reported one drug law and six liquor law violations. Bloomfield College reported one drug law violation and 22 liquor law violations. 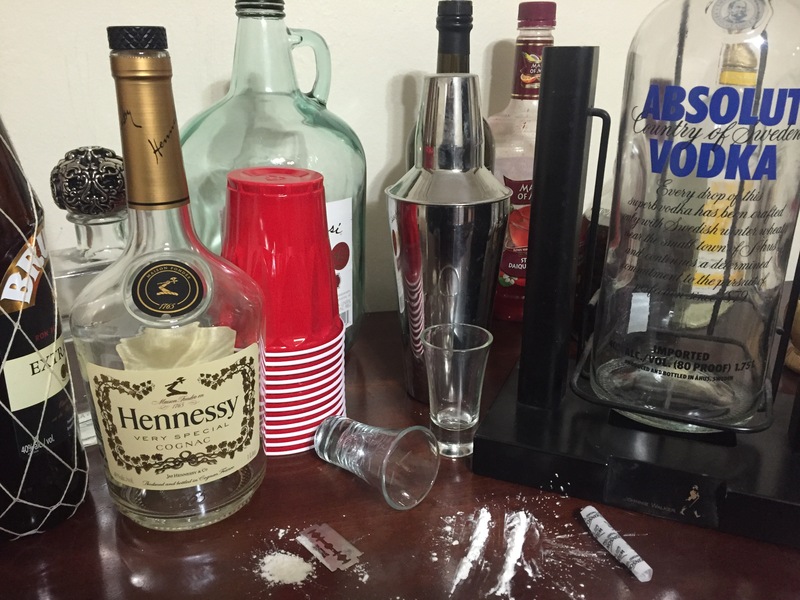 Drew University reports a total of 70 drug law violations and 162 liquor law violations. Drew University has about 1,000 less students than Saint Peter’s with a total of 2,291 enrolled. Yet, their reports almost triple the numbers at Saint Peter’s. Current junior at Drew University, Jessica Sroczynski, recalls an incident on campus her freshman year. “My friend Nikki was caught smoking pot her freshman year and since at the time it was just a first offense she only had to do ‘community service’ meaning she had to make anti-drug posters and then pay a fine,” said Sroczynski. “At my school when you get in trouble for drugs or alcohol you have to meet with a man named Jimmy who assesses the problem and decides your punishment and also figures out if you are in need of counseling for drug or alcohol abuse”. Sroczynski added that her friend Nikki no longer attends Drew. “My freshman year I was caught vomiting in the freshman dorms one night from alcohol so the R.A. called public safety. A few days later I get an email saying I have to meet with Jimmy,” Scrocynski said. “When I meet with him he asks me a ton of questions on why I was so drunk, I mentioned that I hadn’t eaten so he took that as alarming. He sent me to one counseling session just to be sure I was okay as well as make posters for my community and pay a $50 fine,” she explained. Similar to Drew’s Jimmy, Saint Peter’s University has Dean Anthony Skevakis that handles the judiciary action and assesses the consequences of issues. During an interview he elaborated on administrative role he plays at SPU. At Saint Peter’s if you are caught using or selling drugs there is a zero tolerance policy and you will be suspended from school and possibly face other more serious charges. “Everyone had that mutual agreement that if you won’t tell I won’t tell, amongst dormers,” said current Saint Peter’s junior, Kay Munoz. “If you’re going to drink on campus just be responsible about it, don’t be too rowdy or disrespectful to people otherwise you’ll get caught”.